Genetic algorithm techniques are used to find optimum length and other principal dimensions for K1, K2 and K4 class kayaks over a range of speeds and displacements. A three parameter hullform family is used to investigate the effects of waterline, cross-section, and buttock shapes. Leo Lazauskas and E. O. Tuck. 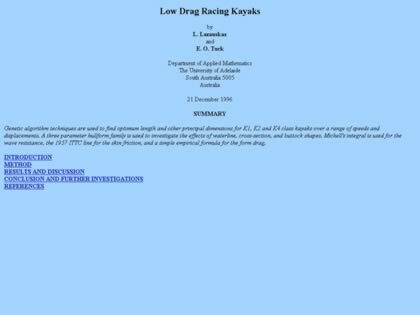 Web Site Snapshot: If available, above is a snapshot of the Low Drag Racing Kayaks web site at http://www.cyberiad.net/library/kayaks/racing/racing.htm as it appeared when this site was added to the directory or last verified. Please Note that Boat Design Net has no involvement with the above web site; all content and images depicted in the above thumbnail are the property and copyright of Low Drag Racing Kayaks unless otherwise noted on that site. Description: Genetic algorithm techniques are used to find optimum length and other principal dimensions for K1, K2 and K4 class kayaks over a range of speeds and displacements. A three parameter hullform family is used to investigate the effects of waterline, cross-section, and buttock shapes. Leo Lazauskas and E. O. Tuck.